This report contains the detailed assessment of Colombia’s defence institutions as part of the Government Defence Anti-Corruption Index (GI). The GI assesses the existence and effectiveness of institutional and informal controls to manage the risk of corruption in defence and security institutions and of their enforcement. 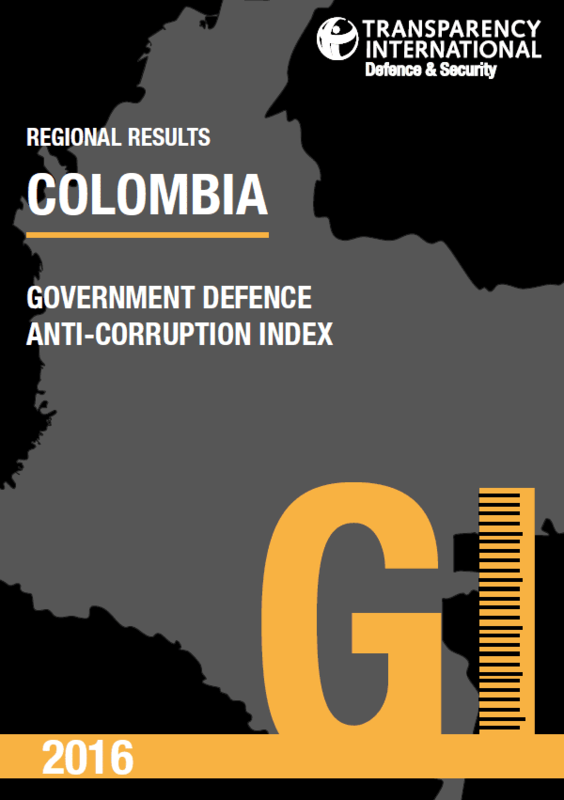 Colombia’s GI ranking is in Band B (from A – very low risk to F – critical risk), indicating a low level of defence corruption risk. The highest risk areas identified are Operations and Procurement (Band C – medium risk). In the past years, there have been notable efforts by the government to improve transparency and accountability in the defence sector, such as the Ministry of Defence’s “Plan to Ensure Integrity and Prevention of Corruption” published in January 2015. However, there are still significant challenges that the government needs to address to reduce the risk of corruption in the defence and security sector, especially given the historic peace agreement recently reached with the country’s largest rebel movement, FARC (‘Revolutionary Armed Forces of Colombia’), after a decade-long conflict. We are working to upload the assessment to the GI website.